Operated by SOQUEM, the $1.0 million program will involve at least 3,500 m of diamond drilling to test high potential gold (Au), zinc (Zn), and copper (Cu) targets on the new B26 basemetal horizon, situated south of the previously producing Selbaie Mine (historical production 53.0 Mt @ 40.7 g/t Ag, 0.6 g/t Au, 1.9% Zn, and 1.0% Cu). The 2019 winter drilling program will test formerly-defined Ore Vision™ 3D induced polarization (3D-IP) anomalies that are understood to represent SOQUEM’s “B26” Cu-Zn-Ag-Au deposit horizon (SOQUEM 43-101 mineral resource 2018—an inferred resource of 4.41Mt @ 9.0 g/t Ag, 1.07 g/t Au, 2.03% Cu, and 0.22% Zn) and an indicated resource of 6.97Mt @ 43.0 g/t Ag, 0.60 g/t Au, 1.32% Cu, and 1.80% Zn) and also to additionally assess the known historical base metal mineralized drill intersections existing on the property. The project is situated in Carheil and Brouillan townships, 5 km southwest of the previously producing Selbaie Mine. The property includes 113 contiguous claims stretching about 53.7 km2. The project, in which Imperial Mining Group has 100% stake, is currently subject to an option contract entered into in 2017 where SOQUEM can receive a 50% stake in the project by carrying out exploration activities totaling $3,750,000 over the span of four years. 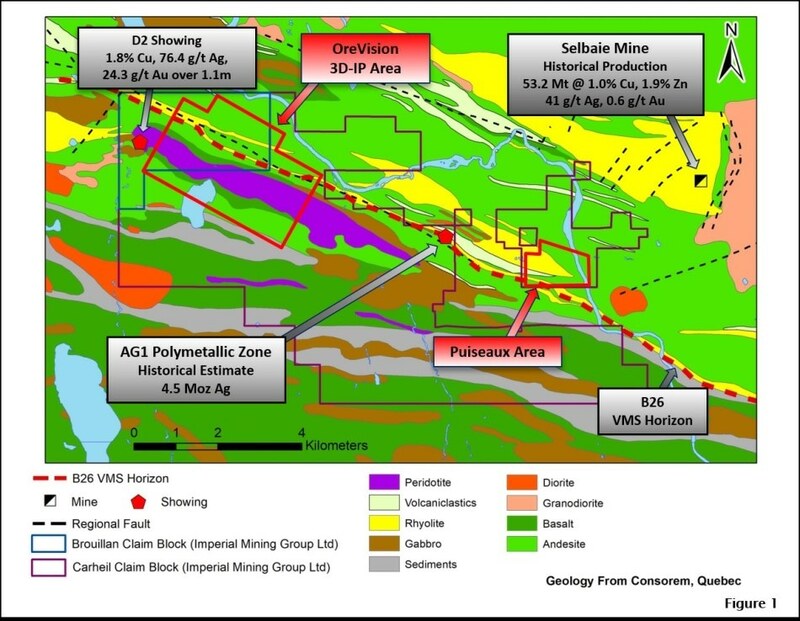 After its 2019 exploration intentions are completed, SOQUEM will have sustained a total of $1.75 million towards exploration expenses on the property. Furthermore, a 3,500 m diamond drilling program will be completed by SOQUEM to test a couple of areas on Imperial Mining Group’s property straddling the western extension of “B26” base metal deposit of SOQUEM. The first target area is situated at the property’s northwest end to test Ore Vision™ 3D-IP geophysical targets. Through a survey, various geophysical anomalies were detected at the Carheil property’s western part that is believed to be associated with copper-zinc and gold mineralization needing additional evaluation. Diamond drilling will be carried out to test locally coincident low-resistivity and high-chargeability anomalies on the western extension of the “B26” basemetal horizon. Past diamond drilling performed in this region detected robust basemetal-style alteration and favorable geology. The second target area—the Puiseaux Target—is situated at the property’s northeast end. Historical diamond drilling performed on neighboring claims returned strongly basemetal mineralized intersections (around 0.32% Cu over 11.0 m) associated with robust alteration and favorable geology. The diamond drill program will begin at this month end and is anticipated to be completed by mid-March. The drill program’s contractor is Spektra Drilling of Val d’Or, Québec. Once the program is completed, samples obtained from drilling will be sent to SGS Canada Inc. of Val d'Or, Québec for further geochemical analysis.